No site does as good a job of helping you choose a freeware tool for a specific task than Gizmo's Freeware (otherwise known by us old-timers as Tech Support Alert). The site is simply unrivaled in terms of recommendations for freeware, and if you ever find yourself asking what the best free windows utility is for a given task, it's *the* site to visit. In each well-organized category, top alternatives are reviewed, rated, and ranked, and then discussed by all -- and reviews are frequently revisited and updated, which is a rarity. 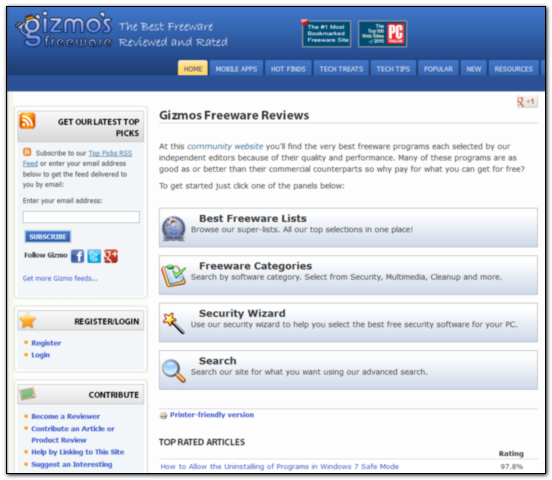 In addition, Gizmo Richards himself has also long been a friend to freeware authors, helping to shine the light on new freeware tools, and a friend to us from the early days, helping to tell people about DonationCoder and our software -- and I am extremely honored to have had some of my tools recommended on the site. I can't think of a better site to receive the first entry in our list of our Favorite Websites.